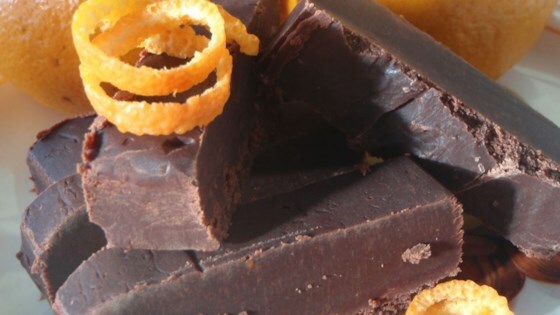 "A simple fudge recipe combining semisweet chocolate chips, condensed milk, pecans and grated orange peel. Use almonds, or any kind of nut, if desired." Line an 8 x 8 inch square pan with parchment paper. Melt chocolate chips with condensed milk in the top of a double boiler or in a bowl in the microwave. Stir until smooth. Remove from heat and stir in pecans and grated orange peel. i found the orange flavor to be a little overwhelming, kind of burned the tongue in the aftertaste. Maybe I just got a flavorful orange or didn't do it right. Very quick and easy. Add 1/2 tsp orange extract for more orange flavor. Yum! This is awesome fudge! It tastes like a Cadbury Chocolate orange! I added a tsp vanilla extract, a 1/2 tsp orange extract and 2 Tblsps of butter. Delicious! Instead of orange, I used key lime juice and added 1 cup of coconut for Key Lime fudge.